Society for the Welfare of Autistic Children (SWAC) was formed by a group of dedicated parents of children with autism in 2000 with the aim of educating, training and rehabilitating children, adolescents and adults with autism to develop and perform to their fullest potential, making them independent and active members of the society, enabling them to integrate and contribute to the mainstream of national development and establishing their rights as citizens of this country. SWAC is a pioneer, non–profit, non–government, non-political and voluntary organization rendering services to individuals with autism and their families in order to improve the quality of their lives for over seventeen years. An autism friendly world where all children adolescents adults with autism have equal rights, participation and opportunities in every aspect of life, integrate into all mainstream activities and lead meaningful lives with dignity and respect that they deserve. • To develop modern, excellent quality and appropriate education, training and variety of services and facilities for children, adolescents and adults with autism in order to maximize their full potential and make them independent and active members of the society regardless of their race, religion, caste or creed. • To facilitate a barrier free environment, improve the quality of lives and empower the individuals with autism and their families. Transform the autism population into assets instead of being a burden to the society. • Create mass awareness about autism in order to eradicate prejudice preconceived ideas and promote positive mindsets and attitudes. • Publishing newsletters and annual magazine. SWAC is running two special sections/centres for underprivileged disabled children (Dhaka) and for the children with autism and other disabilities from indigenous community, Rangamati Hill District, Rangamati. 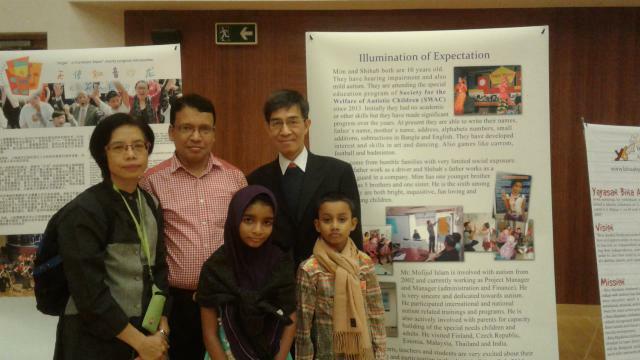 Mofijul Islam is the Deputy Director of the Society for the Welfare of Autistic Children (SWAC). Any kind of your support or any funding /project will encourage us to move forward for the greater interest of the children and adults with autism and other disabilities. Workshop on Autism was held: Workshop on Autism was held on 28 October, 2017 at Chamber of Commerce Auditorium Rangamati, Mr Dipankar Talukder , former state minister was present as the Chief Guest, Mr Krishna Chandra Chakma, Chief Executive Officer(Deputy Secretary), Tribal Refugee Affairs Task Force, Khagrachari , Mr. Md Akbar Hossain Choudhury, Mayor, Rangamati, Pourosava and Mr Sunil Kanti Dey former President of Rangamati press club were present as special guests. Mrs Subarna Chakma, Founder parent member of SWAC and Secretary presided over the occasion,Teachers from different institutions were present as trainee. Md Mofijul Islam, Deputy Director, SWAC and Shakila Islam, Senior Teacher, SWAC School for Autism conducted the workshop on autism. 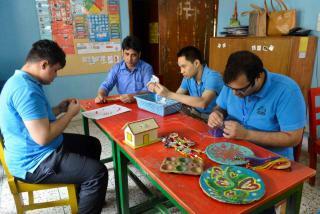 Students of preparatory Work & Activity Centre. 15+ studnts have been included preparatory Work & Activity Centre Preparatory Work and Activity Centre: SWAC has set up a Preparatory Work and Activity Centre with the focus on functional education and training to prepare the students for adult life. The students work on Paper Technology, Jewelry, Laundry, Paper Print – bags, envelopes, gift wrap, Textile Print – block, tie dye, sewing, Art, Card, Office Skills – type, print, laminate, photocopy, perforate and file documents, distribute notices and letters, Dry Flower Arrangement, Cookery, Cafeteria – prepare food, wash dishes, take orders, serve food, clean tables, take payment and give receipt, Nursery – plant trees, water plants, paint tubs, Cleaning – sweeping, dusting, mopping, Life Management Skills, Independent Skills, Behavioural Skills. Two students from underprivileged disabled section had been selected as as Talent Kids for the Autistic Talent Gala 2016, Hong Kong. They traveled along with Deputy Director, Md Mofijul Islam from 24-29 November, 2016 and they performed their talents.